I've seen a couple of lads trying to work out how to convert K13GT cruise onto an S but haven't seen it completed as yet - so this Aussie kit appears the only electronic option. Yeah I reckon I'd try the throttle lock first if I wanted cruise that badly, tho I can't imagine I'd use it much on a bike really. I hate this commercial selling terminology, kind of like selling exhaust fumes for fresh air. I have to agree with the commercial selling "fumes". A throttle lock is definitely not the same as a cruise control. It's not just about the difference between maintaining a set speed vs. a set throttle position (think of average speed cameras on a section of road that undulates … ) but it's also about the way a cruise control can be turned off through use of brakes. That could be really useful in a sever "unplanned" situation. I'd consider £1000 for a proper cruise control but wouldn't touch a throttle lock for £30. I love cruise on my cars but wouldn't pay a penny extra for it on a bike. The throttle lock however is fabulous. It certainly doesn't 'lock' the throttle. All it does is apply a little adjustable friction to the end of the twistgrip to hold it open against return spring pressure. The whole purpose, for me, is to relieve wrist and arm ache on long motorway stints and keep me fresh. In any unplanned situation where I was flapping my hand about to stimulate circulation I'm in way bigger trouble than a stiffer twistgrip would cause; like no front brake (in my case, no brakes, period ). With my hand on the twistgrip, my natural reactions to slowing is to close the throttle, not rely on the return springs to do it for me (doesn't everyone) and the additional friction of the 'lock' is undetectable to me. Near £600 seems a lot to give your right wrist a rest. Where do you get the £600 from Ron? Interesting that it is shown fitted partly over the bar end weight Rae. 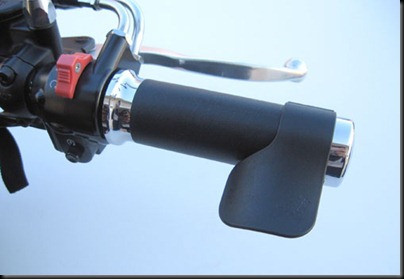 Like that, does it actually provide friction to hold the throttle open when you take your hand off the bar? The fact that it's over the bar end was just coincidental, I have mine fully on the grip so cannot comment on the friction grip factor.